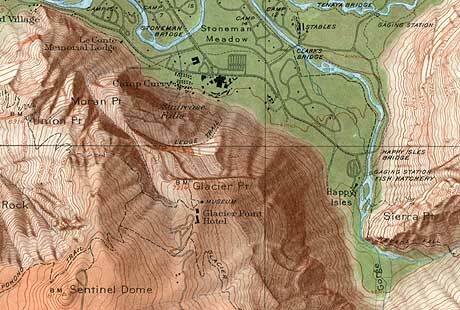 The USGS (United States Geological Survey) produced limited numbers of topographic maps with shaded relief. “Panoramic View of the Yosemite National Park, California” by John H, Renshawe, USGS, 1914. 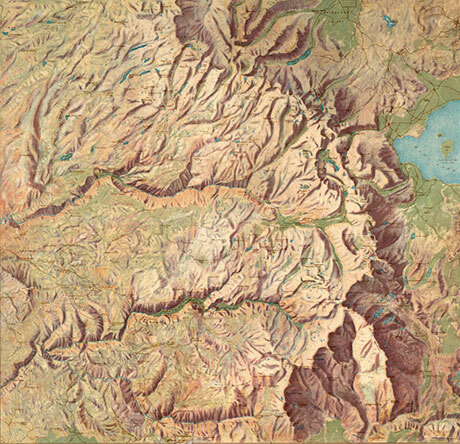 Around 1913, the USGS produced the first shaded relief maps for the western national parks using watercolours. Around 1925, charcoal, pencil, crayon, and chalk came into use. Although the maps made after WWII with the airbrush technique were a great improvement over more traditional earlier methods, they still lacked necessary contrast. To make up for this deficiency, experiments involving two film negatives of the relief plate followed. The first plate (brown) printed a broad range of light and medium tones and the second plate emphasized only the darkest shadows. A third plate (green) accentuated the valley depths, which was later replaced by magenta. The map of Yosemite below features airbrushed relief shading produced in 1946 and published in 1949. “Yosemite Valley” (detail), original scale 1:24,000, USGS, 1949.